A gazebo tent can be a lifesaver when it starts to sprinkle during your outdoor party! We've researched and reviewed some of the best-selling backyard canopies out there to make it easier for you to stay cool and dry. First, check out the list of specs below that you should consider when shopping around for a gazebo tent. Tip: While some canopies can handle mild wind and rain, never use your canopy in strong wind for your own safety. Side Wall: An included side wall can help protect you from the sun, rain, and wind--or you can get one separately. 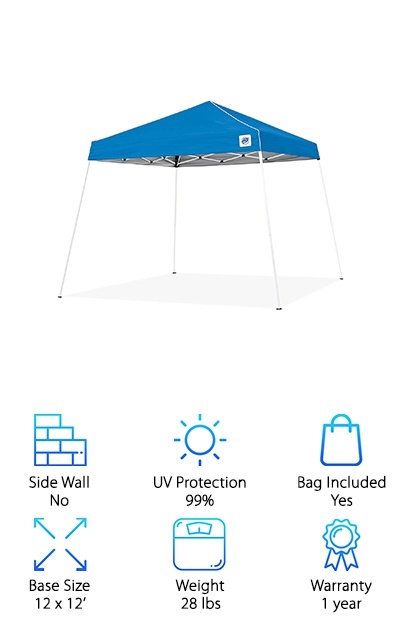 UV Protection: Stay cool and avoid sunburn with a backyard canopy that has a high UV protection rating (in percentages). Bag Included: You shouldn't have to tote your canopy around in a garbage bag--keep it all together with an included carry bag! Base Size: How big is the tent's footprint? This is important for your available space and how much shade it provides. Weight: Most gazebo tents range from 30-50 pounds, so keep that in mind if you want to carry one around. Warranty: The warranty options offered ranged from one to two years in the pop-up canopies we researched. Ready to get some shade? Our top pick and budget pick are the best options we found in our research. However, if the specs aren't quite what you're looking for, keep reading! We have eight other products that we just couldn't resist. Our reviews are definitely in-tents! The best canopy for wind and rain that we found in our search, the Quick Shade GO Canopy combines value with an ultra-portable design. It has a 7x7’ footprint that is smaller than the other products that made it to our reviews list, but what we loved about this option was how seriously portable it was. It weighs just 14 pounds and packs up into a backpack that’s ideal for camping, beach days, and other expeditions that require carrying the bag more than a few feet from your garage or car. A half-length side wall provides additional shade when the sun starts to dip towards the horizon, too. An Aluminex-backed canopy provides UV protection and a cooling effect even on hot days. 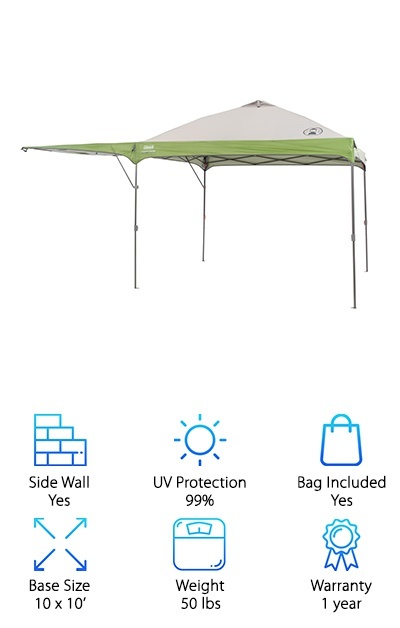 Other canopies with comparable quality and footprints of 10x10’ weigh anywhere from 30 to 50 pounds, so the Quik Shade GO Canopy is truly a marvel among its kind! Our budget pick for the best canopy for rain and wind comes from popular tent manufacturer Coleman. Providing 100 square feet of shade, the vented roof helps to keep heat from building up under the canopy (and defeating the purpose of having a sun shade in the first place). The tough frame is easy to set up with a pinch-free pole extension design. Ground stakes and pre-attached guy lines come with the canopy tent, so you can secure the frame against windy conditions. The canopy itself is made from rugged, thick Polyguard 2X fabric that’s made to last. It all packs up into a wheeled carry bag that makes storing and transporting the tent kind of… easy! Some of the tent setups on our list that weigh 50 pounds don’t have wheels on their carry bags--ouch! (Otherwise, they’re great tents.) You can also get a side wall attachment separately at a low cost for extra protection and shade. The Quik Shade Expedition EX64 comes in black, green, navy blue, orange, purple, red, or royal blue canopy colors. It has a 10x10’ footprint with slanted legs for extra stability. The canopy is made from 150D polyester canvas with UV protection and Aluminex backing to keep you cool. The powder-coated steel frame resists corrosion and has a bolted construction that makes it more durable. The frame’s pivot points are plastic-reinforced, and nylon feet coverings keep the frame from scratching wood and plastic surfaces. You can adjust it to three different height settings, and it sets up quickly with push/pull latch sliders and leg extenders. A carrying bag with a shoulder strap is included, but you’ll have to get your own stakes for a more “permanent” tent installation. This canopy system weighs 29 pounds, so it’s on the lighter end and is easier to transport. The Abba Patio Outdoor Gazebo Canopy is available in blue, gray, and tan color schemes and has a 10x10’ footprint. It’s a strong option for the best canopy for wind and other poor weather conditions! Made from tough-as-nails 300D oxford polyester fabric, the canopy is water-resistant and coated for UV protection. The powder-coated frame uses a cross-truss ceiling design for greater stability even in windy conditions. It’s not as comfortable for tall people to move around in, but it can hold up better in wind and rain. The canopy tent packs up into a wheeled roller bag, so it’s easy to tote that 44-pound setup around! Four guy lines and eight ground stakes are included for additional sturdiness when you set it up. 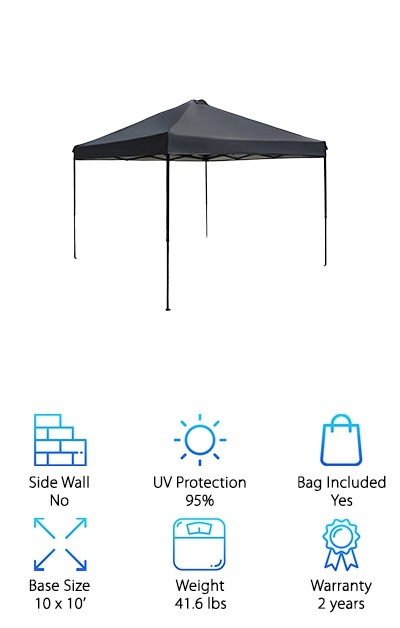 If your backyard party is threatened by breezes and rain, this canopy’s wind-resistant design is a good product to have on your side. The powder coating on the steel frame resists chipping and rust over time, too! 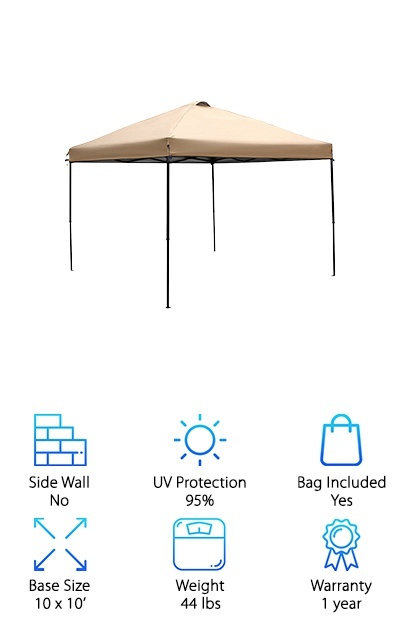 If you want a backyard canopy tent that stays cool even when the sun is beating down, the Coleman Instant Canopy might be for you. The canopy features a framed vent that helps release trapped heat, so it doesn’t build up over time. The 13x13’ footprint makes this a larger-than-average entry-level canopy that provides 169 square feet of delicious shade. The included bag has easy-pull wheels to make transport way easier. Other canopies that weigh close to 50 pounds like this one expect you to carry it all on your shoulder! This gazebo tent also has an extended canopy design that provides additional shade beyond the frame. So as the sun moves across the sky, you’ll still have plenty of shade. It’s surprisingly easy to put up and take down, and the vented top makes it a great option for hot summer days and trips to the beach. So you need a big gazebo tent canopy with full-coverage side walls, but don’t want to blow a ton of cash? We hear you! The Caravan Carport Canopy measures 10x20’ and is ideal for parties and other events. Four of the six removable sidewalls have clear windows, while two have a middle zipper for entering and exiting. When the sun is shining, just zip off a few of the sidewalls. But if you’re preparing for rain or a blustery day, leave them on for shelter from the elements! The iron frame features spring pins and elastic ball straps to make assembly fast and easy. Set up this little pavilion for your next party or conference on the lawn or on a hard surface. For an even bigger party, this pop-up pavilion is also available in a 10x30’ size. 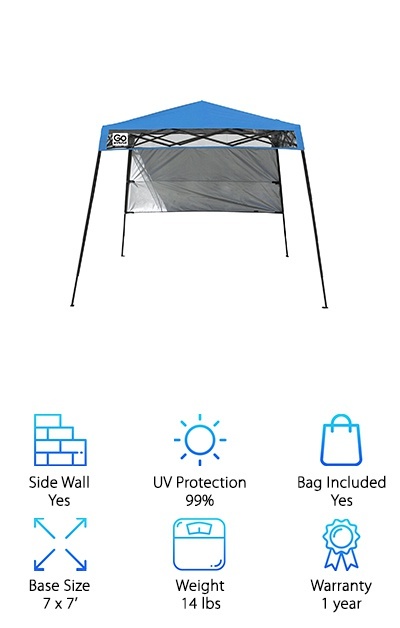 The full-coverage side walls give you a lot of options for how you set up this canopy tent. The Caravan Canopy V-Series 2 is available in blue or white with 12x12’ and 10x10’ coverage options. We’ll focus on the 10x10 model here. The canopy features slant legs for extra stability and a cathedral-style steel frame that means your tall buddies won’t have to duck their heads. The frame is made from powder-coated steel with soft-press slider brackets. You can set it to three different heights up to 8’7’’. 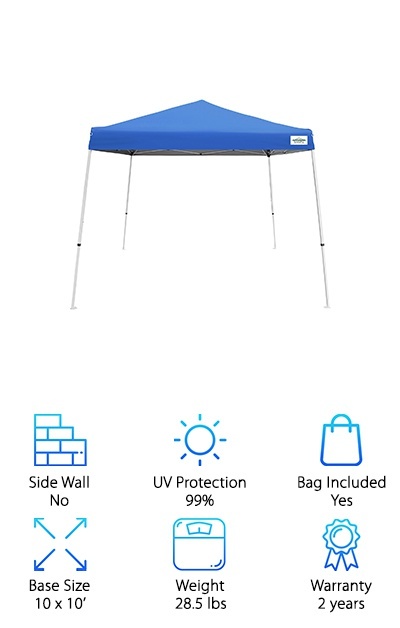 The water-resistant 150D polyester canopy provides 64 square feet of shade and strong UV protection. The included bag is made from tough 420D polyester for secure transport. 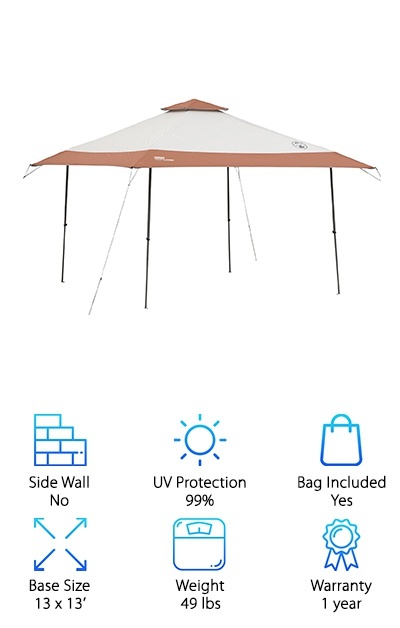 This canopy tent is a lightweight model under 30 pounds and comes with a nice two-year warranty. The bolted frame pieces are stronger and easier to replace than other entry-level models, which usually have riveted pieces. 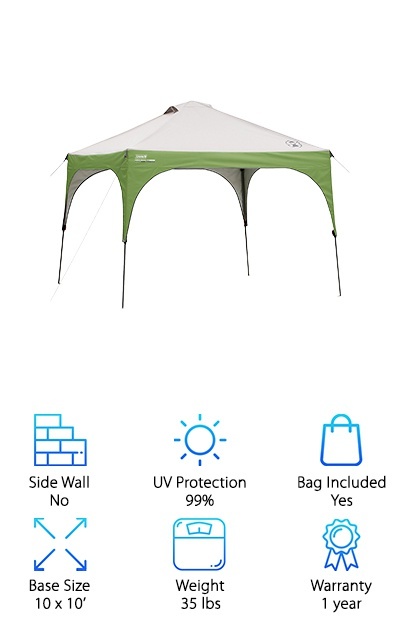 If you’re looking for a basic gazebo tent that will last you a long time, the Caravan Canopy V-Series 2 is a great choice! The Coleman Swingwall Instant Canopy has a 10x10’ footprint with a “swingwall” that can be set up as an awning or left down to block the sun, wind, and rain. The swingwall provides another 60 square feet of overhead shade if you set it up! This Coleman canopy sets up quickly and has ergonomically-designed comfort grips to make setup easier. A UV Guard coating blocks up to 99% of UV rays, and it’s rain-resistant as well. When it’s time to head home, the canopy folds up into a compact size to fit into the included carrying bag. 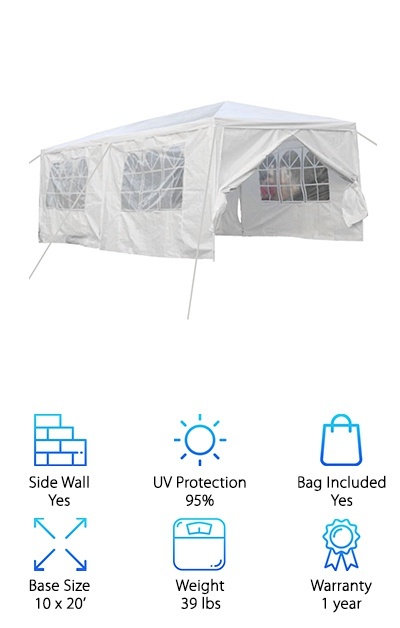 It’s not the lightest canopy on our list, but it’s sturdy! We also love the multi-function swingwall. Use it on the beach to block blowing sand, or set it up in the backyard to keep the buffet table out of the sun. Coleman is known for their camping tents, but their gazebo tents are worth a look, too! The E-Z UP Swift Instant Shelter is available in 10x10’ and 12x12’ base sizes, but we’ll focus on the 12x12’ option for our review. This gazebo tent features angled legs for extra stability and multiple height adjustments up to 8’9’’! A cathedral-style ceiling provides plenty of headroom for tall people, and the canopy provides UV protection ideal for days at the beach. The canopy is water-resistant as well for rainy days! The powder-coated steel frame folds up to a length of 49’’ to fit into an included bag with a shoulder strap. It’s also a lightweight gazebo tent option, weighing just 28 pounds! Set it up easily and enjoy the 64 square feet of shade! It comes with stakes to secure the gazebo tent against wind as well. The lightweight design makes it a good option for taking along on a camping trip or to a sporting event. The Punchau Pop-Up Canopy Tent features roofing that is waterproof and UV-coated to handle the elements. If you register your product with the manufacturer, you get a two-year warranty instead of the automatic one-year warranty--that’s a pretty good deal! The canopy frame has quick-release buttons to make setting it up and taking it down easy. Three height adjustments (65’’, 69’’, and 73’’) plus an open ceiling with no crossbar make this canopy comfortable for tall people to use. It all folds down into an included carrying bag with a shoulder strap to a 50’’ length that should fit in most car trunks. Stakes are included as well to secure the canopy tent against windy days. The 10x10’ footprint is perfect for setting up a picnic table or a few lawn chairs to lounge in the shade. 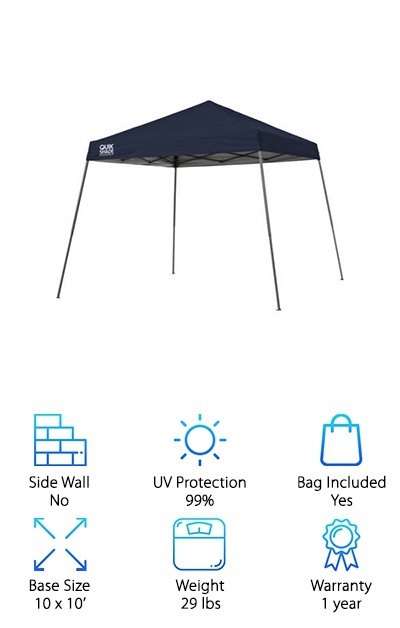 The warranty and solid design make this a great little canopy tent for your backyard or your next tailgating event!